Our Fire Extinguisher Inspection Tags and Labels will help you know that your extinguishers are ready to use. 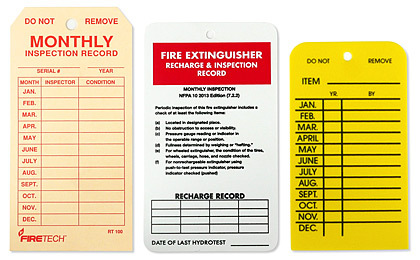 Attach inspection tags to all of your fire extinguishers and inspect monthly. We have a variety of tags for your individual needs and an assortment of fasteners. Fire Extinguisher Classification Label "ABC" Pictorial, 4 1/2" x 1 3/4"
Use Only On - BC - Fire Classification Label - 4 1/2" x 1 3/4"
Large CO2 Extinguisher With Hose and Horn Instruction Label - 3" x 5 1/4"
Instruction Label for ABC Fire Extinguisher With Nozzle - 3" x 5 1/4"
Aluminum Fire Department Connection Sign - 6" x 4"